19 Things We Are Thankful For. Especially You. Jeannine: I would like to focus on two aspects of your amazing multi-faceted music career; your work as Portland, Maine’s Municipal Organist playing the historic Kotzschmar Organ, as well as your work as an educator. Before we get started with more detailed questions, would you please introduce yourself to our readers. 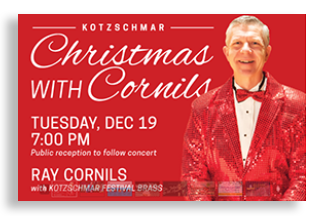 Mr. Cornils: I grew up in a small town in Illinois where the organist at the church my family attended was a graduate of University of Michigan, Ann Arbor. He was a fine musician, so I grew up hearing fine organ playing. I started piano lessons at age 7 and then at age 13 began my organ studies. 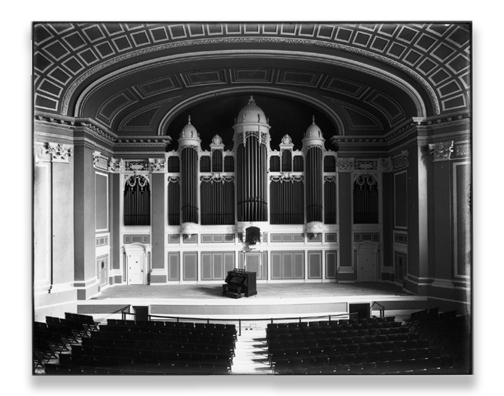 I majored in Organ Performance at Oberlin Conservatory (B Mus) and New England Conservatory (M Mus). After living in Boston for 10 years, my husband and I decided that we wanted to move to Maine. That was made possible when in 1987 I was hired as Minister of Music at a major UCC church (First Parish Church, UCC, Brunswick Maine). I was able to build a strong music ministry with a fully graded choral program (with choirs for ages 4 through adult) and a handbell program. The church has an 1883 Hutchings/Plaisted tracker organ and was where Harriet Beecher Stowe worshiped during the time she wrote Uncle Tom’s Cabin. I held this position for 30 years, through the church’s 300th anniversary celebration in 2017. In 1990 I was named the 10th Municipal Organist for the City of Portland Maine where I remained for over 27 years. Additionally I was an adjunct music faculty member at Bowdoin College in Brunswick Maine, where I taught organ, and the University of Southern Maine, in Gorham Maine, where I taught organ, harpsichord and advanced keyboard skills. I have also been very active in the American Guild of Organists, serving in many leadership positions including being Convention Coordinator of the 2014 National AGO Convention in Boston, MA. Jeannine: What did your work as the Municipal Organist for the City of Portland, Maine involve? Jeannine: With such an intense church and Kotschmar schedule, it is amazing that you had time for additional activities. However, the work you have done in education is incredibly creative and truly astounding. Would you kindly describe some of your work with young people and how each of us might take steps to provide such opportunities to further and promote the organ in our own communities? Mr. Cornils: In the late 1990’s the FOKO board noted the aging of our audiences. After much discussion, we developed an educational outreach program targeted at working with students at various local schools. Using the AGO Pipeworks curriculum, developed by the Seattle Chapter of the AGO, we worked with local teachers and school administration to align a curriculum with the Maine State Learning Standards, using the organ and its music as the launchpad for exploration of various subjects. David Wallace, a local organ builder and curator of the Kotzschmar, designed and built a small, 5-rank pipe organ that can be moved into the classroom. It has both an electric blower and a hand pump. Using plexiglass panels, key and stop actions are easily visible. With the guidance of then FOKO Executive Director Kathleen Grammer and under the excellent leadership and highly experienced Chair of the Education Committee, Dr. Elsa Geskus, FOKO offers education curricula based on how a pipe organ works, the music, life and times of J. S. Bach; the music, life and times of Olivier Messiaen; and a wave-form energy unit for science classes. We called this program Kotzschmar 4 Kids. In addition to in-classroom experiences, we would take classes of students to a local church organ for a concert, which was designed to illustrate and reinforce the learning concepts presented in the classroom. 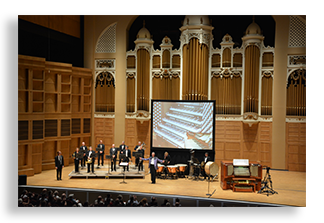 At the end of the school year, the classes would then come to Merrill Auditorium to hear and explore the Kotzschmar Organ in a program called Meet the King of Instruments. We also developed a one-day festival of integrative arts and science, Kotzsch-O-Rama, an all-day immersion in the music of Bach or Messiaen through various stations of activities in art, creative writing, movement, science, and creations in various media to the music of one of these composers. 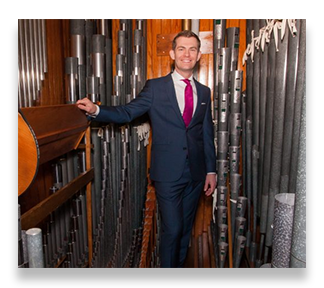 Our goal is to give every child an understanding of and appreciation for the pipe organ, especially the Kotzschmar Organ, through an integrated educational exploration in the areas of math, science, music, social studies and history, as well as to experience a live performance specifically geared to their age level at Merrill Auditorium. In addition to my educational pursuits with FOKO for about 10 years, I taught as part of the faculty of the Young Organist's Collaborative (YOC), based in Portsmouth, NH. This organization has given scholarships to about 1-=16 high school organists per year for study with a YOC faculty member. They also participate in a group masterclass each year and perform in a year end recital. There is a wealth of wonderfully talented young musicians who are now playing the organ because of this program. Many have gone on to major in organ in college and are in successful careers as organists. Jeannine: Let’s go back to the Kotzschmar organ and your position as the Municipal Organist. What is the history of this unique organ and position? better men and women and to appreciate that indefinable something that is an expression of the soul." Will C. Macfarlane came from his position at St. Thomas Church, Fifth Avenue, in NYC to become the first Municipal Organist. Over the years, now 11 fine musicians, including the legendary Edwin H. Lemare, have served the people of Portland as Municipal Organist. In the early 20th century many cities throughout the country had city organs and city organists. The “King of Instruments” was able to bring a wide variety of music, from organ literature and orchestral transcriptions to sing-alongs and silent movie accompaniments to the general public. In addition, the organ can be a member of symphony orchestras to join in the substantial literature that employs the organ in either an ensemble or solo role. Over the centuries, a number of cities were no longer able to maintain their civic organ, and with the advent of other forms of musical opportunities and entertainment, many cities abandoned their municipal organist program. When a number of local organists and enthusiasts heard of this, they banded together in support of the organ. In 1980 the Friends of the Kotzschmar Organ (FOKO) was formed. They negotiated with the City to become the official caretakers of the organ on behalf of the city. 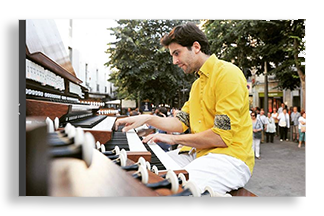 The city continues to own the instrument, however, FOKO raised money to hire a Municipal Organist and began a program of regular maintenance and repair of the ailing instrument. The good news is that in the mid 1980’s the city reinstated partial funding for the care of the instrument. Without FOKO, I am afraid that the Kotzschmar Organ would be silent now and probably would have been removed from the auditorium when the building was renovated in the 1990s. The organ is an excellent example of early 20th century American symphonic organ building. It has a wealth of 8’ sound (there are eight 8’ principals dispersed through the organ, over 25 ranks of strings, many orchestral reeds, and a wealth of percussion). Most all of the instrument is also under expression and over half of the instrument’s 104 ranks are voiced at mp or softer (although it can also generate a very heroic sound), allowing a huge range of dynamics and timbres. It has a strong bass, making it a worthy partner in much of the orchestral literature. The organ has had a number of additions. In 1927 Mr. Curtis payed for a substantial enlargement which included adding an entire Antiphonal Division, substantial additions to the Swell, minor additions to the Orchestral Division, and adding many more toys and percussions to the instrument. In the early 2000’s a Great Mixture was added and in 2012, a new pedal 32’Contra Bombarde, a 16/8/4 Open Diapason unit to the pedal, as well as a couple of stops to the Swell and additional cymbals and a “toy counter”. The instrument now stands at 104 ranks. 7,101 pipes distributed over 7 divisions with 5 manuals and pedal. While there are a few other organs in the country owned by cities, San Diego and Portland are the only cities with a paid position of Municipal Organist. Jeannine: As Municipal Organist you not only played the Kotzschmar Organ, but were instrumental in fundraising and implementing the renovation by Foley-Baker of the organ. What is the organ’s history and its future? Mr. Cornils: The very hardworking and effective FOKO board have brought the organ back to full health after the instrument was at the brink of death in the late 1970’s. It has been a decades-long venture. When the board and I were looking at the approaching 100Th anniversary of the organ (in 2012), we held a private symposium (in 2007) which invited several highly-regarded consultants to meet with the board and members of the city to assess the condition of the organ. The auditorium had a couple of revisions and expansions over the past century. In the 1960’s the organ was moved back. During that move, the Austin universal windchest was torqued. Other events over the years made for a situation that the universal windchest was experiencing many wind leaks throughout it. The only way to remedy this situation was to provide a completely new windchest. Since removing the windchests required the removal of the entire instrument, we decided that the best way to proceed as a total renovation of the entire instrument. While this was a $2.5 million project, we believed in the long term, this was the best fiduciary use of our role of caretaker of this great instrument. Due to the strong ties of trust that FOKO and I built with the city over the years, the city council voted unanimously to fund half of the renovation costs through a bond process. I must also mention that the success of capital campaign for this project is due in great part to the extraordinary efforts of the FOKO fundraising committee chaired by Laurence Rubinstein and Peter Plumb. When, after the wonderful renovation by Foley-Baker, everyone has been blown over by the instrument’s vibrancy and brilliance. Even the most casual listeners in our audience have been amazed at the renewed sounds.The organ is now ready to serve the next century with renewed vigor. The future is very bright for the instrument, especially under the guidance of James Kennerley, my successor and Portland’s 11th Municipal Organist, who started his work January 1, 2018. Jeannine: Thank you, Ray for sharing not only your story, but the fascinating story of the Kotzschmar organ as well.